Today's difficult economy requires info pros to keep on top of technological tweaks and resource changes. To distinguish themselves from the casual searcher, info pros need to deliver relevant results in a timely and professional manner. They must recognize high quality sources. 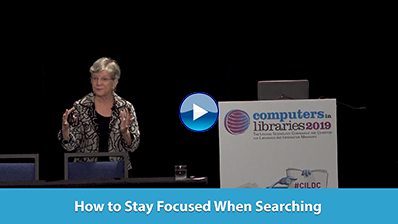 WebSearch University teaches researchers how to maximize the value of Google, efficiently use other major search engines, discover targeted search engines, and cost-effectively deliver results. At WebSearch University, internet searchers improve their skills, add to their intelligence quotient, and refresh their search competencies. In its ongoing trajectory toward transparency, the World Bank announced on April 10, 2012, that it would make its publications open access (OA) under Creative Commons licenses. Its OA policy becomes effective on July 1, 2012. The World Bank, an international financial institution dedicated to lending money to developing nations and eradicating poverty, is also a fervent gatherer of information. Librarians and other information professionals are much more interested in the World Bank as a data source than as a lending agency. The World Bank collects data not only on economies, debt, finance, and poverty but also on health, education, urban planning, agriculture, mining, energy, and rural areas. Baker & Taylor, a distributor of digital and physical books and entertainment products, and Findaway World, LLC (Findaway), the creators of Playaway, Playaway View, and Catalist Digital, announced plans to launch a robust digital audiobook platform for public libraries and retailers later this year. The partnership leverages Findaway's extensive digital audiobook catalog and existing Catalist Digital platform with Baker & Taylor's Axis 360 digital media platform to create a seamless mobile listening experience available for libraries, patrons, and consumers—from audiobook selection to download. OAPEN (Open Access Publishing in European Networks) announced the launch of the beta version of Directory of Open Access Books, a discovery service for peer-reviewed books published under an open access (OA) license. DOAB provides a searchable index to the information about these books, with links to the full texts of the publications at the publisher's website or repository. The Institute of Museum and Library Services (IMLS) revamped the webpage for its Museums, Libraries, and 21st Century Skills initiative. Museums and libraries visiting the page will now be able to access practitioner videos, a PowerPoint presentation, an updated resource list, and a toolkit that will help them organize 21st-century skills workshops in their communities. These new resources join IMLS's 2009 report and self-assessment tool already in wide use.